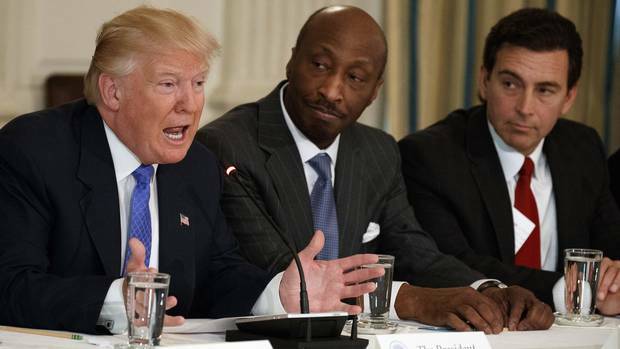 In this Thursday, Feb. 23, 2017, file photo, President Donald Trump, left, speaks during a meeting with manufacturing executives at the White House in Washington, including Merck CEO Kenneth Frazier, center, and Ford CEO Mark Fields. For U.S. business leaders, navigating President Donald Trump's controversies is proving to be a thorny task. Kenneth Frazier, the chief executive officer of pharmaceutical giant Merck & Co., resigned from the Trump administration's manufacturing council early on Monday, in protest against the President's weak initial response to violence at a white-supremacist rally in Virginia. By doing so, Mr. Frazier became the latest in a growing line of corporate executives to accept informal advisory roles with the White House, only to walk away when Mr. Trump's actions or policies proved to be too contentious. Under Armour CEO Kevin Plank and Intel CEO Brian Krzanich also resigned from the manufacturing council on Monday. "America's leaders must honour our fundamental values by clearly rejecting expressions of hatred, bigotry and group supremacy," Mr. Frazier said in a statement that was posted on Twitter. But the majority of Corporate America has remained silent or has denounced racism without criticizing the President's actions. After other business leaders were pressed to follow Mr. Frazier's lead and resign from the manufacturing council, the group's head, Dow Chemical Co.'s chief executive Andrew Liveris, took to Twitter to reject hatred, racism or bigotry. But Mr. Liveris did not resign from the council, nor did he criticize how Mr. Trump reacted to the white-supremacist rally in Charlottesville, Va., where a man is accused of driving his car through a crowd of counterprotesters, killing one woman and injuring others. Mr. Trump's initial response was to say he condemned the "egregious display of hatred, bigotry and violence on many sides." However, he did not personally denounce neo-Nazis, the Ku Klux Klan and other white supremacists by name until about 48 hours after the rally and a few hours after Mr. Frazier announced his resignation on Monday. Likewise, Campbell Soup Company said racist ideology must be condemned, but said its chief executive would remain on the manufacturing council because it was important to provide input on matters that affect the soup maker's industry. The head of private equity firm Blackstone, Stephen Schwarzman, also rebuked the "bigotry, hatred and extremism," and did not resign from his presidential advisory role: "As the President said today, I believe we need to find a path forward to heal the wounds left by this tragedy and address its underlying causes." Corporate crisis managers said companies are starting to believe that it is safe to repudiate the President. "We are approaching a tipping point where it will be more important for companies to act sooner rather than later," said Richard Levick, founder of Levick Strategic Communications and a veteran crisis manager. In the first few months of Mr. Trump's presidency, Mr. Levick said he was getting client inquiries on how to stay on the good side of Mr. Trump's tweets. After Merck announced that Mr. Frazier was leaving the council, Mr. Trump quickly responded by tweeting the executive "will have more time to LOWER RIPOFF DRUG PRICES!" Now, Mr. Levick said, his clients, which include Fortune 500 companies, are starting to feel safer about speaking out. Meg Whitman, the chief executive of Hewlett Packard Enterprise, praised Mr. Frazier's decision and said on Twitter: "I'm thankful we have business leaders such as Ken to remind America of its better angels … Americans expect their political leaders to denounce white supremacists by name." Lloyd Blankfein, the chief executive of Goldman Sachs who has called the President's decision to bail on the climate-change deal a set back, tweeted: "Lincoln: 'A house divided against itself cannot stand.' Isolate those who try to separate us. No equivalence w/ those who bring us together." Since Mr. Trump won the presidency, companies have been trying not to anger Mr. Trump while ensuring that their brands are not tarnished on social media. Companies such as Carrier Corp. and Ford Motor Co appeared to manipulate Mr. Trump by announcing plans to keep certain manufacturing jobs in the U.S.
Apart from Monday's resignations, this latest crisis has not inspired many business leaders to speak out. who runs the Revolving Door Project, which examines corporate influence in the executive branch. "American headquartered companies increasingly spend more branding themselves progressive via advertising and public relations while exhibiting conscientious corporate behaviour with declining frequency," he said. Now that Ken Frazier of Merck Pharma has resigned from President's Manufacturing Council,he will have more time to LOWER RIPOFF DRUG PRICES!